January 14, 2019  Secretary of State Mike Pompeo's trip to the Middle East started with controversy over U.S. plans to withdraw from Syria and ended in discussions about the killing of Saudi columnist Jamal Khashoggi. January 13, 2019  The Saudi kingdom has been a longtime U.S. ally, but the killing of journalist Jamal Khashoggi has angered many Americans. Pompeo will meet with the Saudi Crown Prince on Sunday. January 12, 2019  Secretary of State Mike Pompeo is meeting with Gulf allies to try and keep the region focused on the U.S. goals of fighting terrorism and countering Iran. January 10, 2019  In Cairo, Secretary of State Mike Pompeo made a stinging rebuke of the Obama administration's approach to the region. But the comments left some wondering what the Trump administration's strategy is. January 9, 2019  Secretary of State Mike Pompeo made an unannounced trip to Iraq where he met top officials. The trip comes two weeks after President Trump visited U.S. troops but did not meet with government leaders. 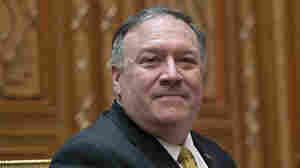 January 8, 2019  Secretary of State Mike Pompeo began an extensive trip to the Middle East on Tuesday to try to resolve confusion about the Trump administration's plans to withdraw troops from Syria. January 2, 2019  U.S. officials visited an American man detained in Moscow on espionage charges. The Trump administration said it would demand Paul Whelan's immediate release if the detention "is not appropriate." December 31, 2018  President Trump wants South Korea to pay more for the U.S. troops based there. The current agreement expires Monday as the negotiations continue. December 20, 2018  Another U.N. envoy ends his tenure, with no peace process in sight, though the war in Syria does seem to be grinding to a halt. December 13, 2018  The Trump administration is trying to counter what it calls Russia and China's predatory practices in Africa and promote U.S. businesses instead through an initiative called "Prosper Africa."